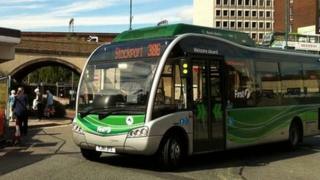 Bus companies are to bring in Oyster-style smart ticketing in some of England's largest urban areas. Greater Manchester passengers will be the first to get the new payment format, to be introduced in 2015. The scheme will also be rolled out in Tyne and Wear, Merseyside, South Yorkshire and West Yorkshire as well as Nottingham, Leicester and Bristol, according to transport chiefs. Oyster cards launched in 2003 in London, where buses are now cashless. In the West Midlands, nearly 30 operators are already part of the Swift smart multi-operating ticketing scheme. Greater Manchester is rolling out its "get me there" travel card across its Metrolink trams. The bus initiative involves the Stagecoach, First, Arriva, Go Ahead and National Express companies. In a joint statement, the chief executives of the companies involved said the move would deliver a "wider benefit than the capital's Oyster system". They said: "Millions of people in our biggest city regions will benefit from this transformational initiative to provide London-style smart ticketing. "Bus operators share the aspirations of our city regions to become growing economic powerhouses and we know high quality public transport is an important part of making that happen." Audio Do cashless buses signal the end for physical money?